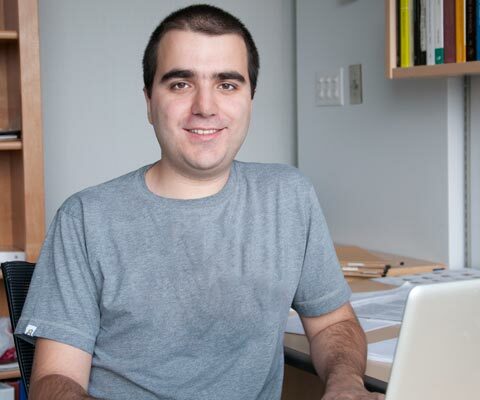 Perimeter Institute faculty member and adjunct professor at the University of Waterloo, theoretical physicist Dr. Pedro Vieira has earned a 2015 Sloan Research Fellowship for his explorations into the foundations of quantum field theory. He also won the prestigious Gribov Medal given by the Physical European Society to a young researcher in the theoretical physics fields of particles or quantum field theory. At Perimeter, Dr. Vieira tackles the toughest and most long-standing problems of quantum field theory. He uses a mathematical technique called holography to translate questions about four-dimensional field theories into questions about two-dimensional string theories. That makes it possible for him to look at the questions through the use of integrability, a powerful mathematical technique for exactly solving two-dimensional theories. Holography then relates the solution in two dimensions back to a solution in four dimensions. A graduate of the Universidade de Porto, Portugal, Dr. Vieira earned his master’s and PhD at the École Normale Supérieure in Paris, France. He joined the Perimeter Institute in 2009. * Pedro Vieira is one of 24 Canadian winners of major international research awards in 2015 featured in the publication Canadian excellence, Global recognition: Celebrating recent Canadian winners of major international research awards.